Through a wealth of undergraduate and graduate programs, we prepare students for a lifetime of learning, discovery and career success. Humanities and Social Sciences at NC State affords every student the chance to find his or her passion and purpose. With more than 50 undergraduate majors and more than 40 minors, 15 master’s degrees and five Ph.D. programs, our academic portfolio encompasses the liberal arts and the social sciences. We teach students to become critical thinkers and active, 21st-century citizens. We push them to study abroad, pursue undergraduate research, and seek out internships and nonprofit work — all of which broadens their minds and brightens their prospects. Such an experiential education ensures they leave here ready to lead in the real world. As one of the largest departments at NC State, we enroll some 700 undergraduate majors and close to 100 graduate students. Our graduates enter the work world prepared to inform and engage citizens, to help organizations operate more effectively, to persuade people to make healthy personal and environmental choices, and to develop and maintain more satisfying relationships. Our award-winning faculty collaborate on research and teaching, working within and across their areas of expertise. Mastering English is a key to success in every profession that requires communication, interaction and understanding among human beings. Our graduates go on to successful careers in public relations, technical and corporate communication, law, teaching, editing, creative writing, sales and marketing, journalism and more. Our faculty are remarkable scholars with outstanding research records that have earned them recognition as national and international leaders in their fields. We teach courses in 15 different languages, from French to Farsi, Spanish to Chinese. Our classes range from elementary language courses to advanced work in language, literature, conversation, composition and civilization, and specialized courses such as business Spanish and French cinema. Students can learn to teach English as a second language, become a certified French or Spanish teacher, or study abroad with one of our outstanding faculty members. We prepare graduates to interact confidently and appropriately with diverse populations around the globe. We are dedicated, serious, gregarious historians who love what we do. We take pride in our scholarly accomplishments, our excellence in teaching, close faculty-student contact and engagement with the wider community. Our graduates are lawyers, business owners, museum directors, doctors, archivists, politicians, judges, farmers, military officers — and, of course, teachers of history. They employ their training in historical thinking as they ask why a relationship worked, a merger failed, a disease spread, an idea took hold, or two communities or peoples could or could not coexist. 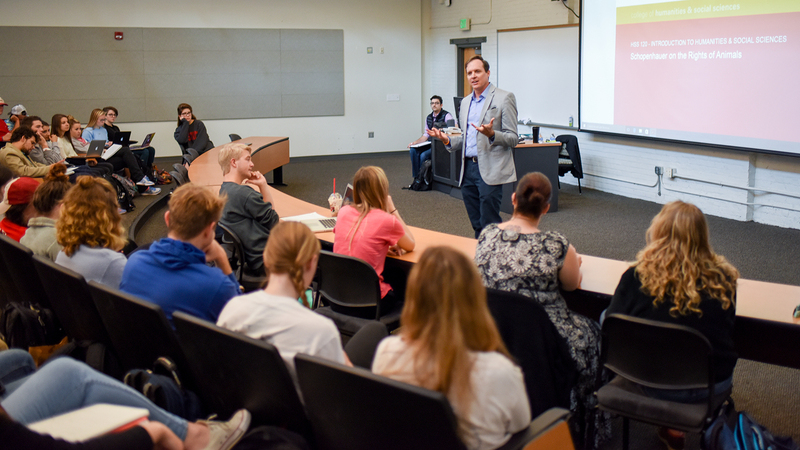 Interdisciplinary Studies focuses on broad themes and complex issues. We connect and integrate perspectives from various disciplines to study the world where we live. Interdisciplinary studies students focus their studies around a range of concentrations, including international studies; arts studies; film studies; science, technology and society; women’s and gender studies; Africana studies; a self-design option; and dual-degree programs. We also offer a master’s degree in liberal studies. Our faculty collaborate across disciplines to teach and conduct research. Our department is home to two distinct disciplines. Philosophy tackles fundamental questions about humanity, reality, mind, knowledge and morality. We develop our students’ capacity to understand, criticize and construct arguments; to analyze and solve problems; and to present their ideas clearly. Religious studies focuses on religion as a human phenomenon, including its impact on politics and society. Our students study the history, texts and practices of major religious traditions and explore religious topics that help them understand contemporary circumstances. We teach undergrads and train doctoral students in five areas: human factors and ergonomics, industrial and organizational psychology, lifespan development, psychology in the public interest, and school psychology. Our research ranges from the influence of aging on cognition to team science, the display of information, and the processes of reading and leadership, among dozens of other topics. We publish extensively and we engage with the public, providing impactful services to communities across the state. The School of Public and International Affairs (SPIA) is home to the Department of Political Science, the Department of Public Administration, an international studies graduate program, a leadership development initiative for law enforcement personnel, an online degree completion program, and various certificate options. Our students intern in federal, state and local government agencies, businesses, and nonprofit organizations, locally and abroad. SPIA faculty combine the practical with the theoretical in their teaching and welcome students to join them in conducting innovative research. We’ve been preparing social workers for a long time: our undergraduate program was one of the first in the nation to earn accreditation, more than 30 years ago. Through our newer master’s program, we help full- and part-time students get ready for advanced practice and leadership positions. Professional values and ethics, cultural competence, social justice and community partnerships are at the core of all we do. Our graduates go on to address children’s welfare, prevent substance abuse, heal wounds and support families across North Carolina. We prepare students for rewarding careers in the public and private sectors. Our students grow to understand communities and organizations and the people who live and work in them. Our faculty and students conduct research on family issues, social networks, poverty and inequality, cardiovascular mortality, and violence and terrorism — to name a few areas. Our research and activities benefit nonprofit organizations, businesses, industry and government. Join the Wolfpack and choose from a broad catalog of degree programs. Take the next step toward mastering your chosen field. Our interdisciplinary linguistics research encompasses numerous projects that involve faculty and student researchers. As the second-largest college at NC State, we enjoy close ties with every part of the larger university. The work we do informs, supports and guides NC State's traditional strengths in engineering and the sciences; in turn, those disciplines provide us with fertile ground for discovery and problem-solving. Our students enjoy all the resources of a pre-eminent technology university, including world-class facilities like the Hunt Library. We offer three honors dual-degree programs that combine a focus in the humanities or social sciences with scientific or professional study — in agriculture, engineering or management. And our faculty create new knowledge at a national hub for interdisciplinary research, home to unique collaborative initiatives like the Genetic Engineering and Society Center and the Public Communication of Science and Technology Project.